Explore Alaska from the comfort of your own rental car. This enticing 9-day Alaska tour is convenient and at your own leisure. With a number of included excursions, this tour package is perfect for the truly independent traveler! We will transfer you from the Anchorage airport to your hotel upon your arrival. 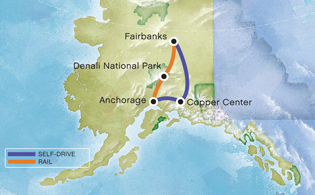 Spend the day exploring Alaska's largest city at your leisure. Overnight Anchorage hotel. Pick up your rental car from Avis in downtown Anchorage. Drive to Copper Center, the Gateway to Wrangell St. Elias National Park, and pay a visit to the National Park Visitors Center. Overnight Copper River Princess Wilderness Lodge. Continue North along the Richardson Highway for your drive to Fairbanks, Alaska’s Golden Heart City. Spend some time this evening exploring the city or take an optional excursion, bookable through the tour desk in the hotel. Overnight Fairbanks hotel. Travel by luxurious railcar to Anchorage — continue to look for wildlife and enjoy views of the peaks of the Alaska Range along the way. Upon arrival in Anchorage, we'll transfer you to your hotel. Explore more of the city or take in a delightful dinner or drinks at your hotel. Overnight Anchorage hotel. We’ll transfer you to the airport at the end of your tour.